From the moment we saw it, we knew we had to do something special. Have you seen it? The SPRINGVILLE quilt by Camille Roskelley is absolutely darling and we think the name is especially great. J We invite you to join us as we sew Springville together here in Springville, Utah! Purchase a kit at the shop or just the pattern and pull together your own fabric combo, cut it out and bring it to our retreat center to sew while celebrating Springville. Although this is not a class, Julie Hancock will be available to help lend advice and trouble shoot. 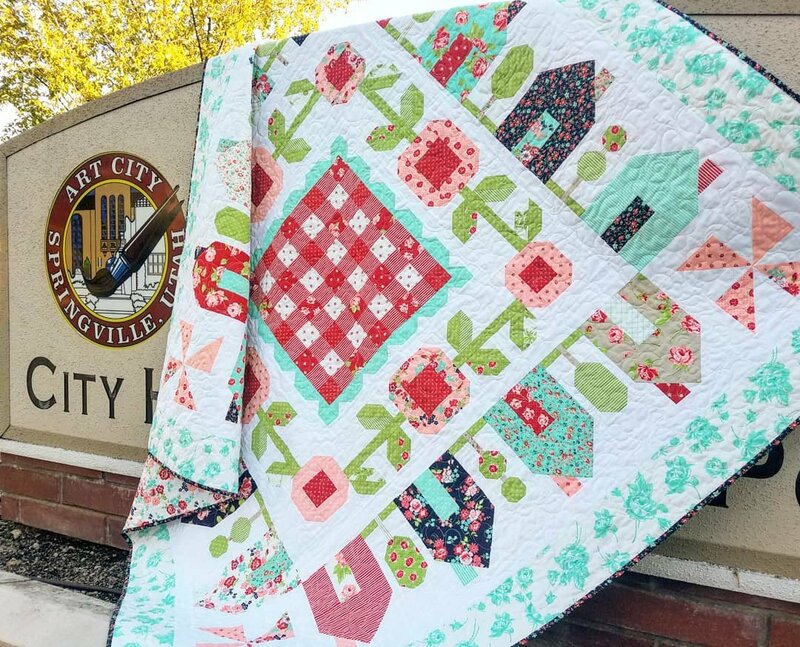 We’ll share some hometown trivia and even learn a bit about the history of quilting here in Springville but most of all we’ll enjoy time with our community of quilters as we sew Springville! Springville Quilt Kit available at Corn Wagon or other fabrics of your choice. We recommend cutting before hand.